Get reliable performance verification of your radiation detection equipment without the inconsistencies of conventional check sources. From beta contamination probes through gamma scintillators to high resolution detectors, Thermo Scientific™ Lutetium Test Adapters provide reliable results without half life correction, transport or decay/disposal issues. These innovative test adapters use high-purity natural lutetium oxide to produce a totally constant and homogeneous surface emission rate with well-defined, reproducible results, regardless of variances in the lutetium-oxide ceramics. 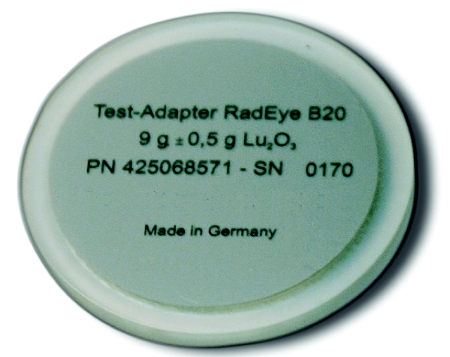 Lutetium Test Adapters offer unique advantages. The rare earth element lutetium contains the isotope Lu-176 with 3.6 E10 years half-life and a natural abundance of 2.6% which yields a highly reproducible and uniform activity of the pure element lutetium of about 50 Bq/g. There is no need for error-prone half-life correction or for reoccurring purchase of the (decayed) check sources. All test adapters of the same type have virtually the same activity. Beta-type adapters provide nearly identical surface emission rates. The design of specially shaped enclosures and high-density Lu2O3 ceramics minimizes the required activity for small-size detectors. Under US DOT or IATA rules for dangerous goods shipments, these adapters are not considered as radioactive material due to their natural origin and low specific activity. High-precision, low-energy test adapters for performance verification of the RadEye B20 and other instruments with pancake detector. 9g Lutetiumoxid inlay (D: 40mm x 1mm height). Housing made of acrylic glas (D: 50mm x 3mm height). Typical net count rate for RadEye B20: 6 cps. Test adapters for large area beta contamination probes like RadEye AB100. Inherently homogeneous surface emission rate of 0.8 particles per cm2·s. 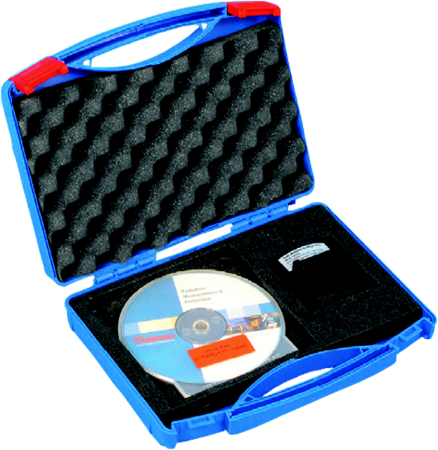 Perfect for training and calibration. 80g Lutetiumoxid inlay (Surface area: 74 × 148mm). Total size: 120 × 200 × 5mm total size. Specially shaped lutetium test adapter to match RadEye PRD housing. Typical net count rate for RadEye PRD: 100 cps. Triggers indication of low energy NBR alarm at the RadEye PRD display. Universal gamma test adapter for portable scintillation detectors and gamma spectroscopy. 50g Lutetiumoxid ceramics (D: 55 × 3mm height) within sealed aluminum housing (D × H: 62 × 7mm height). Typical net count rate for 2 × 2in. NaI(Tl) detectors: 300 cps. Artifical NBR alarm for FHZ 672 E-10 or RadEye NBR. Dual-disc design has a typical net count rate for large area detectors of 1000 cps; 171 × 61 × 17mm (aluminium housing); (2x) D × H: 55 × 3mm (Lu2O3 ceramics). Can be mounted directly to FHT 1388 area detectors (plastic housing); also available with holder for monitors with metal enclosure (ASM/SGS installations). Quad-disc design has a typical net count rate for large area detectors of 2000 cps; recommended for locations with higher background; (4x) D × H: 55 × 3mm (Lu2O3 ceramics). Mounts directly to FHT 1388 area detectors (plastic housing); also available with holder for monitors with metal enclosure (ASM/SGS installations).